Trans-Mars injection has been completed successfully. Trans Mars Injection (TMI) operations completed successfully. The liquid engine burn time was 1328.89 sec and the imparted incremental velocity was 647.96 m/sec. Trans Mars Injection (TMI) operation began at 00:49 hrs (IST) on Sunday Dec 01, 2013. A big night for ISRO and congratulations are due! And not least for ISRO’s coverage of the event – almost live – on their Facebook page. (I have not been too enamoured of the ISRO website but somebody did a great job on the live updates). The Indian Mars Orbiter (Mangalyaan) successfully completed its final burn in earth orbit and has been inserted into a Trans Mars Trajectory (to be confirmed). It may just be one small step in Man’s exploration of space but it is a giant leap for ISRO. After spending a month in 6-ever increasing orbits around Earth the craft now has a 300 day journey to get to Mars with the possibility of 3 mid-course corrections before the liquid engine has to be fired up again to enter into orbit around Mars. A number of “firsts” for the Indian Space Research Organisation (ISRO) and, no matter what may now happen, a great many accomplishments already in the bag. The lack of a sufficiently powerful rocket necessitated that the craft first enter earth orbit and then the month-long, laborious compared to NASA, procedures where the space craft engine had to be used to first to increase the earth orbits and then – tonight – be fired for an extended time (23 minutes) to be inserted into a heliocentric Trans Mars Trajectory. 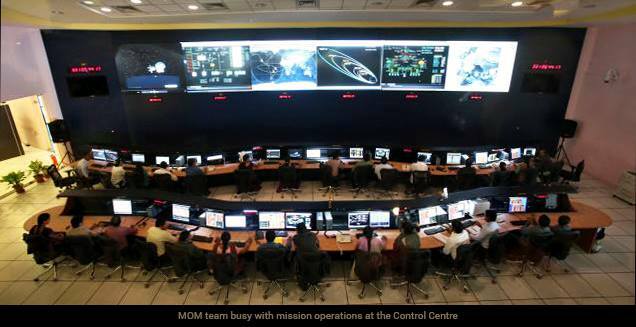 Mission Operations Complex ISTRAC Bangalore. One hour before the final engine firing the craft was put under the control of its on-board computer which was to carry out the final burn. Forward rotation of the spacecraft to put it into the right orientation for the burn was carried out and completed about 20 minutes before firing. Engine firing started on schedule just before the craft reached perigee. The actual burn of the 440 N Liquid Engine lasted its planned 23 minute long firing entirely under local on-board computer control. The objective was to impart an incremental velocity of 648 m/s and the indications are that that was achieved. The engine firing manoeuver seems to have gone exactly to plan. The orbit determination team have now to confirm now confirmed the trajectory actually achieved. When everything is for the first time,achievements are incremental and there are very many critical “moments of truth” to meet and overcome. But now comes a very large “moment of truth” as ISRO prepares to inject the Mars Orbiter spacecraft into its Trans Mars Trajectory. India’s Mars Orbiter (Mangalyaan) is currently in its final orbit around the earth and is scheduled to fire its 440 Newton liquid engine at 0049 hours IST on Sunday morning ( 1919 GMT Saturday 30th November). It entered its final Earth orbit yesterday which has an orbital period of 5575 minutes (just under 4 days) and it should be approaching apogee later tonight (early hours of Friday morning) and the next engine burn will take place at perigee. Currently apogee is about 193,000 km from earth and perigee is around 350km. The spacecraft must first be manoeuvred into the right attitude using its thrusters for the firing of its main engine which must then be fired to impart the correct change of velocity (delta-vee). Both, an incorrect attitude and/or an incorrect delta-vee are potential sources of error. Three mid-course corrections are planned (the first on December 11th) but the margin of error allowable is still extremely small. Too low a velocity change could leave the craft in earth orbit or put it into a heliocentric orbit which does not get close enough to Mars. Too high a delta-vee would also put the craft into a heliocentric orbit which would eventually decay into the sun. I believe there is no chance of achieving a velocity high enough to escape the sun. And even if the velocity change is correct but the direction is too far in error then just another orbital path around the sun would result. NDTV:“The trans-Mars injection- we are planning to depart on December 1, 2013 early hours of 00:49 hours IST and we are going to burn a liquid engine for duration of roughly 23 minutes which will impart an incremental velocity of 648 metres per second consuming a fuel of 198 kgs,” ISRO Scientific Secretary V Koteswara Rao told reporters in Bangalore. K. Radhakrishnan, ISRO Chairman. (For the) trans-Mars injection and its insertion into the Martian orbit, the firing of the liquid engine is done in a closed loop mode. Here, a precision accelerometer is used to estimate the incremental velocity added as the liquid engine burns and when the accelerometer gives a feedback that the required incremental velocity added to the spacecraft has been achieved, the burning of the liquid engine is automatically terminated. So, minor variations in the performance of the liquid engine will not matter because we are cutting off its burning based on the delta-v that is achieved. That is why we call it closed loop of firing. … The spacecraft’s propulsion system, i.e., the 440 Newton liquid engine, will complete its first phase of operations on December 1. It has to be re-started for its operation on September 24 (2014). ISRO: This voyage is achieved by a combination of navigation and propulsion technologies, governed by the gravity of Sun and Mars, and assisted by the 440 N Liquid engine. Further fine tuning of the trajectory is achieved using the Attitude and Orbit Control Thrusters during the Trajectory Correction maneuvers planned en route. … on December 11, we plan to have one small firing for mid-course correction of the spacecraft. 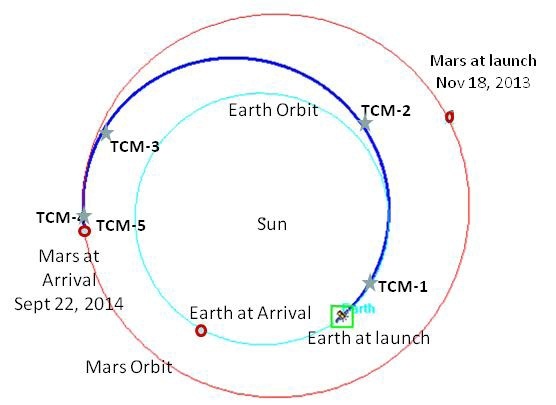 There may be one more mid-course correction during the helio-centric phase, and subsequently, a fortnight before the spacecraft’s arrival near Mars, there will be one more mid-course correction. So there will be three mid-course corrections between December 1, 2013 and September 24, 2014. Mangalyaan is eventually to be placed into a Martian orbit, with a periapsis height of 365 km, apoapsis height of 80,000 km and an orbital period of about 77 hours. So on Saturday I shall have as many of my fingers crossed as I can manage. I suspect there will be many others doing the same across India. 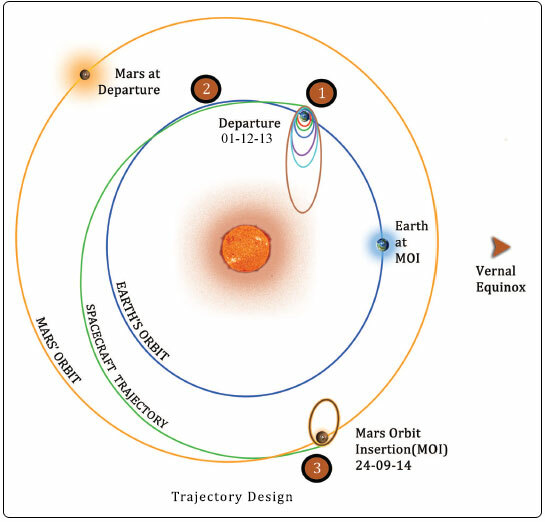 A very critical moment for the Indian Mars Orbiter Mission (“Mangalyaan“) comes a week from today when the spacecraft’s engine has to be fired as it reaches perigee in its Earth orbit, to insert it into a trajectory to reach Mars some 10 months later. The Mission has been criticised both in the West and in India (here and here for example) as being too expensive, too elitist and the wrong priority for a developing country like India. I think such criticism misses the point. “The Indian Mars Orbiter Mission is primarily a test of technology and capability and self-confidence and self-belief”. The cost pales in comparison with the spend on religious festivities and what other much less productive projects can cost. As an example of what frugal engineering can achieve, the inspiration and ingenuity it can foster is immeasurable. If the Mars Orbiter successfully reaches the vicinity of the planet in September 2014, after 300 days’ journey into deep space, it will make India the first Asian country and the fourth in the world to reach the red planet. …. The mission has, however, started an intense debate. While its supporters trumpet its incredibly low cost of around $75 million (a fraction of the cost of a similar American expedition), critics question the logic behind spending any amount when India is dealing with such deep-rooted problems as widespread hunger, poverty and corruption. ……. Mayawati’s park in Noida was constructed at the cost of $130 million, and has 24 huge statues of elephants, and one of herself. Politicians will of course argue that the “feel-good” effects generated by such monuments to themselves or their heroes are well worth the cost! If the MOM succeeds in its main objectives, there is even a case for using the window that is coming in 2018 to attempt a manned trip around Mars and back in 501 days. While the MOM spacecraft “Mangalyaan” is in orbit around Earth, its systems and scientific instruments are being tested to prepare for the critical burn at 0036 IST on 1st December (1906 GMT 30th November) to inject it into a Mars trajectory. The colour camera has been turned on Earth during testing and ISRO has released this photograph. This image was taken yesterday at around 1350 hrs (IST) from a height of almost 70,000 km above earth and has a spatial resolution of 3.5 km. The next critical burn (the seventh) has to to use the 440 Newton liquid engine again to impart a delta-v of nearly 648 m/s and the engine will have its longest burn time of 1,351 seconds. Three mid course corrections on the spacecraft’s journey to Mars are planned for and the fuel carried has to also cater for finally braking to enter into Mars orbit. After the Polar Satellite Launch Vehicle (PSLV-C25) put India’s Mars Orbiter into a perfect earth-bound orbit on November 5, it has been a smooth journey so far for the spacecraft. The Indian Space Research Organisation (ISRO) boosted the Mars Orbiter’s apogee in six complex manoeuvres executed between November 7 and 16. ISRO did this by giving commands from the ground to the spacecraft’s propulsion system, called 440 Newton engine, to fire. A crucial event of the trans-Mars injection of the spacecraft will take place on December 1 by a prolonged firing of the 440 Newton engine. …. Till now, we have completed six manoeuvres including a supplementary one. Currently, the spacecraft’s apogee is 1,92,915 km. In the early hours of December 1, around 00.36 hours, we have the trans-Mars injection of our Mars spacecraft. On that day, we are going to use the 440 Newton liquid engine again to impart a delta-v, that is, an incremental velocity of nearly 648 metres a second to the spacecraft and the engine will burn for 1,351 seconds. It is crucial in the sense that we need to give the exact velocity required to take the spacecraft from the earth-orbit, passing through the sphere of influence of the earth which extends up to 9.25 lakh km from the earth, cruise through the long helio-centric phase, then get into the sphere of influence of Mars, and on its arrival near Mars on September 24, 2014, it has to be put into 376 km plus or minus 50 km above Mars at that point of time. On the same day, the next crucial operation of the spacecraft’s Mars orbit insertion has to take place. When this running of the 440 Newton liquid engine takes place on December 1, we also have eight numbers of 22 Newton control thrusters firing. There are two tasks for them. One is the spacecraft’s attitude control. Secondly, if it is required, they will aid the 440 Newton thrusters to augment its thrust-level. 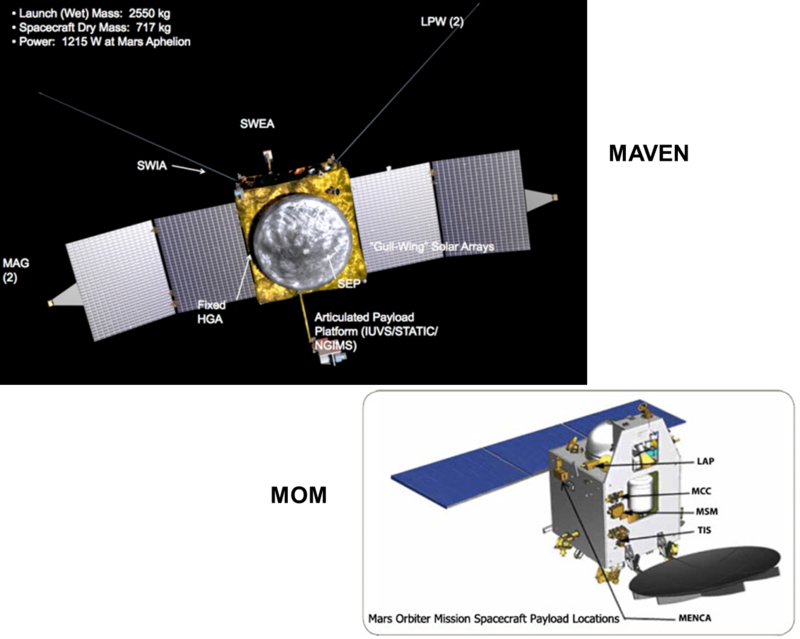 Both the functions will be performed and the Mars spacecraft will then be moving towards the helio-centric orbit. Then on December 11, we plan to have one small firing for mid-course correction of the spacecraft. There may be one more mid-course correction during the helio-centric phase, and subsequently, a fortnight before the spacecraft’s arrival near Mars, there will be one more mid-course correction. So there will be three mid-course corrections between December 1, 2013 and September 24, 2014. With the velocity imparted to the spacecraft on December 1, 2013, we will have an estimate of its expected position on September 24, 2014. We will be continuously tracking the spacecraft and if there are deviations vis-à-vis the end goal, we will make the corrections. So December 1 will be a crucial operation. The spacecraft’s propulsion system, i.e., the 440 Newton liquid engine, will complete its first phase of operations on December 1. It has to be re-started for its operation on September 24. There is thus a long gap. How confident are you that you can re-start the 440 Newton engine after it has hibernated in deep space for about 300 days during the spacecraft’s voyage? We have been using the 440 Newton engine for our Geo-synchronous Satellite – GSAT- missions where the spacecraft’s orbit has to be raised about a week after its launch. In the case of Chandrayaan-1, we had to restart the operation after a fortnight. For that, we had qualified the liquid engine in 2008 to restart after one month. During the last two years, considering the specific requirements of our Mars Orbiter Mission for re-starting the spacecraft’s 440 Newton engine after it has idled for about 300 days, we had done these two actions. One is we have provided a set of parallel circuits for the propellants’ flow-lines and also provided redundancy in the form of a latch-valve. So what essentially happens is that one portion of the fluid circuit will be closed after December 1. The parallel path will be energised for the operation in September 2014. Up to (925,000) km from the Earth, the spacecraft will be in the sphere of influence of the Earth. Subsequently, it will be moving into the helio-centric phase of its flight. It is a long one, where you have to look at the influence of other planets and the Moon and then the solar radiation pressure acting on the spacecraft. That pressure varies with respect to time because the geometry of the sun and the spacecraft matters here. This is something we have not done so far and this helio-centric phase of the flight is new to us. 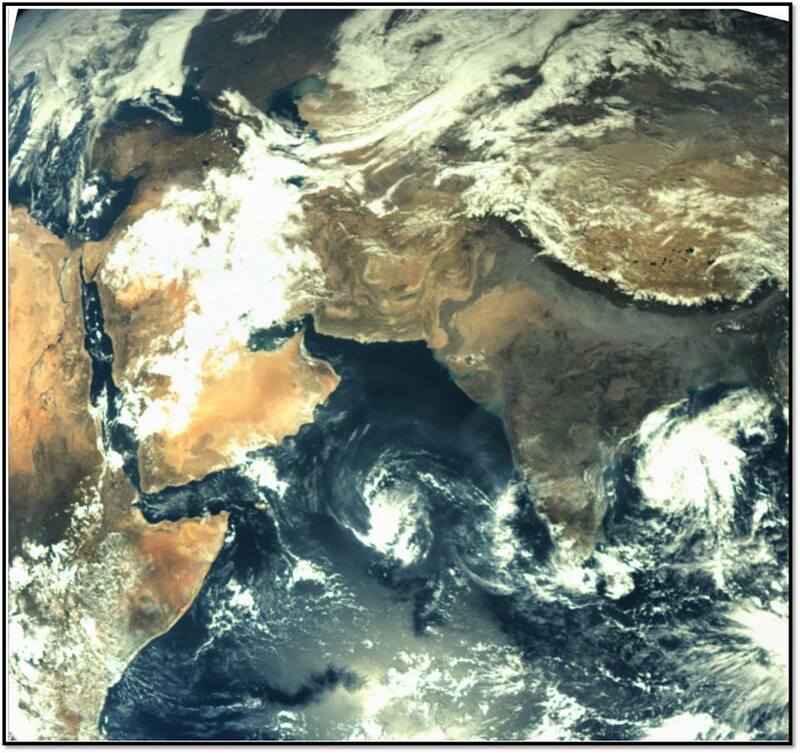 In Chandrayaan-1, we had travelled up to (400,000) km, which was well within the sphere of influence of the Earth. But here for the first time, we are moving out of the sphere of influence of the earth. So how the spacecraft will behave during the helio-centric flight of 680 million km along the arc is new to us. Then the spacecraft gets into the sphere of influence of Mars which is nearly six lakh km from Mars. From our understanding of the Mars gravity model, the influence of the atmosphere of Mars, the influence of the two satellites of Mars and the solar radiation pressure there on the spacecraft are very important. This is also a new thing that we are attempting. So the navigation of the Mars spacecraft from the orbit of the Earth to the orbit of Mars, passing through all these three phases, is a new knowledge that we are acquiring and validating during the next 300 and odd days. A very smooth launch by NASA and lift-off exactly as planned. And with the power of the Atlas V, just 52 minutes 42 seconds after launch MAVEN had separated from the launch vehicle and had been inserted into a Hohmann Transfer Orbit and on trajectory to reach Mars on 22nd September 2014. At 1:28 p.m. EST, NASA’s Mars Atmosphere and Volatile EvolutioN (MAVEN) spacecraft began its 10-month journey to Mars orbit, launching aboard a United Launch Alliance Atlas V rocket from Cape Canaveral Air Force Station in Florida. MAVEN will take critical measurements of the Martian upper atmosphere to help scientists understand climate change over the Red Planet’s history. The Centaur’s single RL-10A-4-2 engine ended its second burn on time. The next major milestone is the release of NASA’s MAVEN spacecraft. Separation! Maven is now on its own. Very smooth and absolutely flawless. In the meantime the Indian Mars Orbiter Mission’s Mangalyaan has another 13 days in Earth orbit in its current orbit (193,000 km apogee) before one more burn of its motors puts it also into a Hohmann Transfer Orbit which should get it to Mars orbit on 24th September 2014. Spacecraft systems – most being operated for the first (or second) time – will be tested while in earth orbit. The “poor man’s route” to Mars! And India and ISRO have some 49 years of US NASA Mars missions to catch up to. And while NASA is showing live feed of the launch, ISRO’s web-site is down – presumably because it could not handle the traffic. The FB page seems fine. Update! 18th November 2013. The launch of MAVEN – in about 1 hour from now – can be seen live on NASA TV. The Indian Mars Orbiter Mission is primarily a test of technology and capability and self-confidence and self-belief. With a very limited budget. The scientific investigations of the planet and the Martian atmosphere are only a secondary or even a tertiary objective. For the Indian mission everything is virtually for the first time. For NASA and the US, the MAVEN mission which is due to launch on Monday 18th November is the 15th Mission to Mars. The first mission (Mariner 3) failed and the second mission, Mariner 4, launched in November 1964 was the first to reach Mars. In the 49 years since there have been a few failures (Mariner 8 in 1971, Mars Observer 1992, Mars Climate Orbiter in 1998 and the Mars Polar lander/Deep Space2 in 1999) and some spectacular successes for NASA with the Mars Global Surveyor in 1996 , the Phoenix Mars Lander in 2007 and the Mars Rover in 2011. Many Mars missions have failed. Between 1960 and 1971 the Russians (USSR) failed in 11 attempts to send a spacecraft to the vicinity of Mars. The 12th attempt with M-71 in 1971 succeeded in orbiting Mars. Of eight further attempts by Russia, 4 failed to reach Mars. The Japanese Nozomi failed while cruising. Two European missions led to one orbiter (but a failed landing) and one flyby. On the surface they may both seem to be similar in that both are attempting to get a spacecraft into orbit around Mars. But the missions are, in reality, quite different. MOM is essentially a first-time test of technology and capability whereas MAVEN is primarily a scientific mission utilising the deployment of now well proven US technology. Technology development on the one hand and a scientific investigation on the other. 1. NASA’s Mars Atmosphere and Volatile EvolutioN (MAVEN) is a space probe designed to study the Martian atmosphere while orbiting Mars. India’s Mars Orbiter Mission (MOM – “Mangalyaan”) is a space probe designed to explore Mars’ surface features, morphology, mineralogy and Martian atmosphere using indigenous scientific instruments while orbiting Mars. 2. MAVEN is expected to have a budget of about $672 million. MOM has a budget of about $70 million. 3. The Atlas 5 rocket to be used to launch MAVEN has the capability to lift about 7,000 kg directly into a Geostationary transfer orbit (GTO). This allows MAVEN (2500 kg) to be injected directly into a Trans-Mars trajectory from launch. 4. MAVEN is due to launch on an Atlas 5 rocket at 1:28 p.m. EST (1828 GMT) on Monday (Nov. 18) from Florida’s Cape Canaveral Air Force Station. Within one hour of launch MAVEN will be in a Hohmann Transfer Orbit with periapsis at Earth’s orbit and apoapsis at the distance of the orbit of Mars. 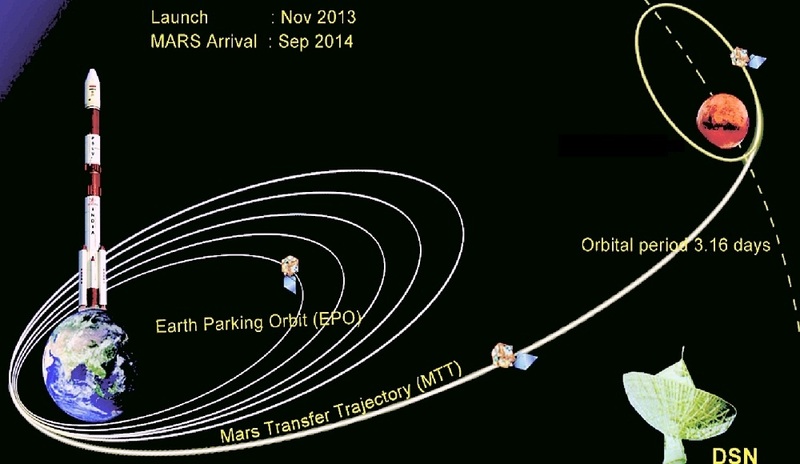 MAVEN should reach Mars orbit on 22nd September 2014. 5. MAVEN’s body has a cubical shape of about 2.3 m x 2.3 m x 2 m high, spans a total of 11.4 m with its solar panels deployed and has a lift-off mass of 2,454 kg (including fuel) and has a dry payload of 903 kg. Mangalyaan’s body is a cuboid measuring about 1.5 m per side, a span of 4.2 m with solar panels deployed and an initial mass of 1337 kg of which 852 kg is fuel. Mangalyaan is carrying a camera, two spectrometers, a radiometer and a photometer. Together, they have a weight of about 15 kg. 7. MAVEN is targeting a science orbit of 150 by 6,200 Kilometers at an inclination of 75 degrees. It will perform measurements from a highly elliptical orbit around Mars over a period of one Earth year, with five “deep dips” at 150 km minimum altitude to sample the upper atmosphere. Mangalyaan will be much further out and targets an operational orbit of 365 by 80,000 Kilometers with an inclination of 150 degrees and a duration of 76.72 hours from where it will perform its science mission. The MOM mission in Mars orbit is open-ended and is expected to last about 160 days. 8. MAVEN’s science phase features regular communication sessions. The spacecraft points its High Gain Antenna at Earth for high data rate communications twice per week with the exact timing depending on Deep Space Network visibility. Those comm sessions take place on Tuesday and Friday and have a duration of eight hours during which at least five hours of Earth pointing are required to downlink all science data and housekeeping telemetry. As missions go, MAVEN represents a Mercedes “S” class to the Volkswagen that is MOM. In spite of a great deal of ballyhoo about ISRO’s heightened and improved publicity, their website is remarkably short of information or updates. There has been nothing new since they reported that the earth orbit correction had succeeded and that was 48 hours ago. They have not even put out a revised mission plan. No doubt they have to be a typical Indian Government bureaucratic organisation but they have much to learn about public relations. They are still stuck in the paradigm of “No news is good news” and haven’t quite realised that “No news, when news is expected, is bad news”. I would have thought that they could at least have put out a daily bulletin. The long silence from ISRO suggests that something may be amiss. (The FB page contains virtually no forward looking information – except the pre-mission plans and photographs). Indian science journalists apparently just wait for official press releases and have no updates and little background to offer. Their lack of pro-active coverage and apparent lack of interest leaves much to be desired. The next scheduled burn is supposed to be on 18th November (according to the original mission plan) to raise the orbit (apogee) to about 200,000km. That would then be sufficient for the injection into a Trans-Mars trajectory with the scheduled sixth burn (actually seventh including the corrective burn 2 days ago). But the mission plan must have been revised. Yet ISRO has not released any information. I can understand their fear of putting out a plan and not being able to keep to it but they will one day realise that being up-front with the plan and its critical parts for an R & D program is by far the best way of keeping on top of communications. And in keeping messages on track. After having successfully tackled a momentary glitch in Mangalyaan’s orbital manoeuvres on Monday, Isro scientists have postponed a crucial exercise. The exercise is to test the five instruments aboard the Mangalyaan before the orbiter embarks on its long journey to Mars in early December. The instruments were to be activated on Monday this week for a brief while to ensure that they work fine. But this procedure will now be carried out next week. I have been trying to follow the mission via the live satellite tracking websites (satview.org and n2yo.com) but I am a little dubious as to how “live” they actually are. 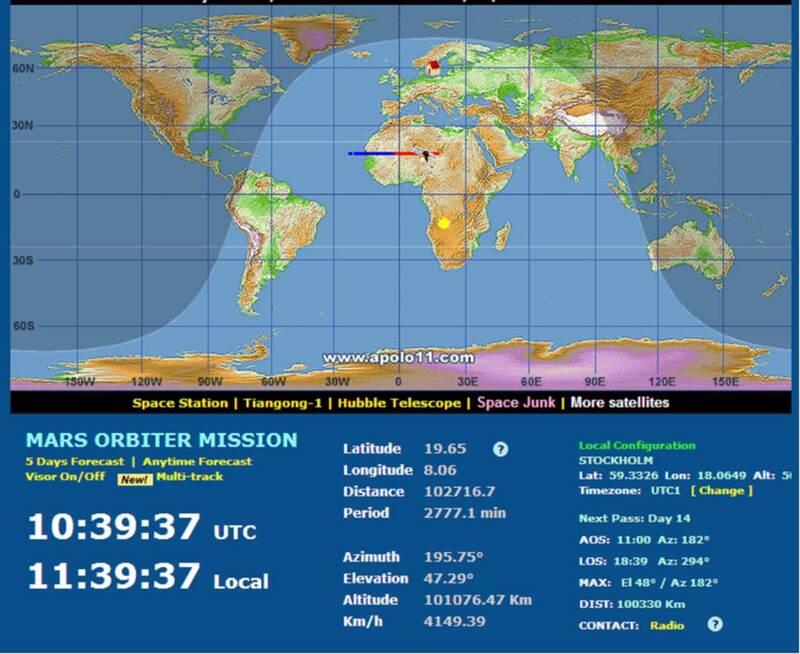 I noted that after the corrective burn 48 hours ago, both sites took almost 24 hours before they showed any change to the orbit. Right now satview is showing a position over Africa at an altitude over 100,000 km but this data needs to be taken with a pinch or two of salt. n2yo.com also shows the same position and gives the following data. Note that both sites give the same location and now also give much the same altitude. They do not match on “speed”. Satview gives a speed of about 4149km/h which is about 1.15km/s whereas n2yo gives a “speed” of 6.9 km/s. I am not quite sure what “speed” is being reported. The supplementary burn made this morning to correct for the incompleteness of the 4th burn yesterday appears to have been successful. The objective was to reach an orbit (apogee) of 100,000 km and this seems to have been achieved with some margin to spare. The observed change is to an orbit with an apogee of 118,462 km. The next step on 18th November is to raise the apogee to just under 200,000 km and then insert the craft into the Trans-Mars trajectory on 1st December. So far, so good and the success of the correction by the supplementary burn is both impressive and encouraging. The Mars Orbiter Spacecraft, India’s first interplanetary spacecraft, was launched into an elliptical earth orbit with a perigee of 248.4 km and an apogee of 23,550 km, inclined at an angle of 19.27 deg to the equator by India’s Polar Satellite Launch Vehicle in its twenty fifth flight (PSLV-C25). The achieved orbit was very close to the intended one. The launch was conducted from Satish Dhawan Space Centre (SDSC) SHAR, Sriharikota on November 05, 2013. The launch of Mars Orbiter Spacecraft occurred as scheduled from the First Launch Pad at 2:38 pm IST after a fifty six and a half hour count down. The first orbit-raising manoeuvre of India’s Mars Orbiter Spacecraft was performed at 01:17 hrs Indian Standard Time (IST) early this morning (November 07, 2013) when the 440 Newton Liquid Engine of the spacecraft was fired for 416 seconds by commanding it from Spacecraft Control Centre (SCC) at ISRO Telemetry, Tracking and Command Network (ISTRAC) at Peenya, Bangalore. With this engine firing, the spacecraft’s apogee (farthest point to Earth) has been raised to 28,825 km, while its perigee (nearest point to Earth) is at 252 km. The second orbit raising manoeuvre of Mars Orbiter Spacecraft, starting at 02:18:51 hrs(IST) on Nov 08, 2013, with a burn time of 570.6 seconds has been successfully completed.The observed change in Apogee is from 28814 km to 40186 km. The third orbit raising manoeuvre of Mars Orbiter Spacecraft, starting at 02:10:43 hrs(IST) on Nov 09, 2013, with a burn time of 707 seconds has been successfully completed.The observed change in Apogee is from 40186km to 71636km. In the fourth orbit-raising operation conducted on Nov 11, 2013, the apogee (farthest point to Earth) of Mars Orbiter Spacecraft was raised from 71,623 km to 78,276 km by imparting an incremental velocity of 35 metres/second (as against 130 metres/second originally planned to raise apogee to about 100,000 [1 lakh] km). The spacecraft is in normal health. A supplementary orbit-raising operation is planned for November 12, 2013, at 0500 hrs IST to raise the apogee to nearly 1 lakh km.